The UK is not just represented on the PWA tour by men, we are fortunate to have some very talented ladies representing us on the world stage with a passion to compete at the highest level. We profile three of our own about their experiences on tour. Originally published within the November ’17 edition. LOCAL SPOT: Gwithian or Seaton, Cornwall. SPONSORS: Simmer National Rider, C-Skins Wetsuits, K4 Fins, NoLimitz masts, Crossfit Plymouth, Puravida Boardriders. Motivation: I have windsurfed for 14 years, steadily improving my skills through travelling and competing on the Student then British series. I am quite competitive so have always wanted to push myself to the highest levels. Add to that the adrenalin of the event, the training goals, the inspiration it gives you, the motivation to train and the friends and experiences you make along the way, it is brilliant to be a part of. Preparation: I work full time as a Chartered Engineer in the South West of the UK, so preparation for the events always has to fit around my work day. My work is relatively flexible, meaning most of the year I can train after work at nearby beaches, or at the weekend taking my campervan with my husband to the beach. In Cornwall I can sail the North or the South Coast, so I can get port or starboard tack conditions, from cross on to cross off. I constantly review forecasts and make training plans to train at least 5 days per week, either in the water windsurfing or surfing, or at Crossfit Plymouth which helps me to stay fit and strong. Aside from those activities, I run, swim, freedive and do yoga at home. I also spend time both behind and in front of the camera to analyse my technique and try to improve it. Competing in the British Wavesailing Association events also keeps me in tune with competing in a variety of conditions across the four events in the UK. 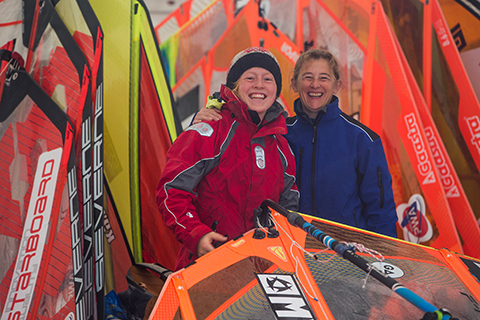 The experience: I have competed in the Wave PWA events for many years with several gaps too. I have only managed to compete in Gran Canaria and Tenerife whilst working full time, but in 2014 I managed the whole tour, competing in the Windsurf Mecca of Hookipa, Maui, Hawaii. This was such an experience! To have Ho’okipa beach to yourself and three other girls was incredible, and a huge adrenalin rush as that particular day had big waves and light wind with a lot of current! After the Pozo event this year, I had to return home to work whilst most other competitors stayed in Pozo or went to Tenerife to continue to train. Needless to say, the UK was not windy in my 3 weeks at home, so I trained at Crossfit and did lots of swimming. I was quite despondent to see the forecast for Tenerife looking pretty dire for when I was about to fly out. I couldn’t help but feel a little disappointed when I had trained all year for a week with no wind! The forecast improved though after a few days of surfing, so much so, that mid way through the competition, the forecast built to logo to mast high swell and 40 knots. The sailing from the whole fleet was amazing to watch, and the atmosphere was tense! I did not know what sail to take for the strong wind, huge shorebreak and strong currents, knowing I would need power to get out, but wouldn’t be able to hold the power wave riding. By the time I sailed, the wind had dropped to 3.7 weather for me. I took a bigger board and despite my nervous anticipation of the heat to come and launching a whole heat before to make sure I got out, I actually really enjoyed the waves and wanted longer than my 14 minute heat to enjoy them! I have seen a huge change in myself over the years of competing too. I get less nervous and try to be more tactical now. I think I appear pretty calm on the outside, even though I am not! Lessons learned: You always take something from a competition. Some lessons are spot specific, such as in Tenerife I generally get my jumps in first before I move downwind where it’s better for waveriding, or in Pozo if it is over 50 knots, I will make sure I have a good forward score at the beginning of the heat before I get arm pump! Other lessons are in tactics, which you learn from experience and through making bad choices in wave selection, kit, or move order and selection. Then there is mindset, and there are ample psychology books on this! This is hugely important to remain at your competitive edge but not over stressed, but also not so relaxed you don’t care enough about the result. It is interesting to see how all the athletes manage this in their own ways, both before a heat and a breakdown within it in some cases. Some athletes will immerse themselves in a music playlist to psyche themselves up, whilst others, including me, sail before the heat, wait around the beach closely watching the heats and try to stay calm and ‘in the zone’. I’ll generally try not to overthink the heat or the competitor, but make sure I have a strategy and know my competition and what they might do. It can sometimes be useful to time your start to follow your competitor to try and match or better their moves. The main lessons I have picked out recently are to do with my risky wave-sailing style, often going all or nothing, which I will do free-sailing a lot but is not always the most consistent way to earn points in a competition due to the higher chance of crashing! Future plans: After every event I come away with a refreshed motivation and a whole list of new moves I want to land or try! I guess that’s the beauty of windsurfing, and the reason behind the addiction, the fact that you never stop improving and there is always that next level to push to! I want to win another British Champion title and continue pushing myself by competing with the girls on the World Tour. There is nothing quite like sailing with someone just like you and pushing each other’s levels. As I sail at home with mostly men, it is easy to disconnect from comparing myself with them, which means sometimes you can lose that competitive edge to improve and be better than your fellow competitors, so it is great to be reminded by competing in the World Tour to keep pushing hard and training. EXPERIENCE: Started T15 in 2009, started slalom in 2015. Sponsors: NorthSails, Fanatic, ION, K66, FoilWorx, VRsport.tv. Motivation: I always want to push myself and improve so PWA was the next logical step up for me; to be the best you have to race the best. There is so much I can learn from these PWA girls that I had to start now. 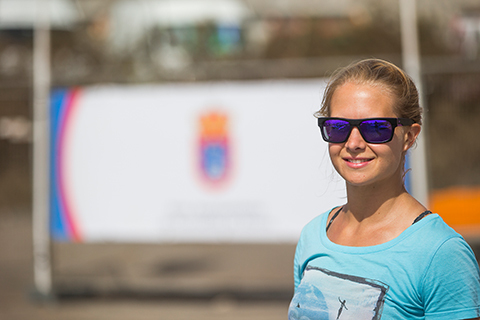 Preparation: I have done 3 years of IFCA international events – 4 World Championships and one European Youth Championship – it’s the best way to prepare for the PWA as most of the girls do both IFCA and PWA. It definitely settled my nerves knowing I had raced most of them before. I had also been training hard for a few months with the Hayling Island Slalom group doing practice races every week, with the likes of James Dinsmore and Leigh Kingaby, who are at the top of the UKWA pro fleet, and many more, which has really improved my ability to come out well of a crowded start and first mark. Experience: My first and only PWA event in Denmark was so much fun. I got to use every sail size from 7.7 down to 4.7, which was perfect for me to compare my level to the other girls in all the different conditions. Being in the same tent as some of the top NorthSails and Fanatic riders I instantly got a load of help tuning which set me up for some great races. I also had my amazing caddy who sailed on the water with me and encouraged me, keeping me focussed and usually with a smaller sail and bigger board to swap around. 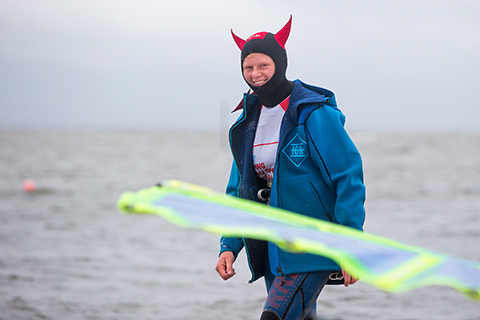 So whatever the hugely unpredictable offshore conditions stormy Denmark shook up I could still race comfortably and to the best of my ability. A caddy is definitely a lifesaver and one I would recommend to all! Lessons learned: The biggest thing I came away with was a huge confidence boost and massive motivational push towards my winter training. But it’s also highlighted the areas I need to focus on in training to improve my results next time. Gybes and starts are definitely on the agenda! I’ve also filled up my notebook with all the top tips from plenty of different riders to take away and study. I’ve also learnt a lot about my equipment in that short week (well, actually, not my equipment, I was kindly lent it for the week). Having only used the North Warps a handful of times, and having never been on 3 of the sizes I signed up, it was a risky move, but it definitely paid off. But it meant I spent a lot of time on the water getting used to my kit when the other girls were on dry land saving their energy for the races, so next time I hope to see the mental and physical benefits of being comfortable with knowing exactly how my equipment should be rigged. Tips included noting the boom settings for each sail, so it can be rigged exactly the same each session, which is super important for training for slalom. A smaller boom gives more direct power but can restrict cam rotation. Slalom sails have a deep belly, so in the gybe, for a smooth rig flick, the battens have to straighten before they can bend on the new side. When the battens are straight they are longer, so the boom has to be long enough to allow this to happen. Also noting the length of the mast extensions and the amount of downhaul put on, so that I can put on the same amount of downhaul every time I sail. Finally, I learnt to put my footstraps further apart in high winds to give me more control over the board, as it favours a more overpowered stance. I also tried out different sized foilworx fins for the first time and I’m now happy with my different fin combinations in choppy conditions. Future Plans: I’m planning to spend 3 months at the TWS Pro Slalom training over the winter to get a load of race experience, which will set me up for the 2018 race season, competing in as many PWA and IFCA events as financially possible as well as the whole UKWA Slalom series. 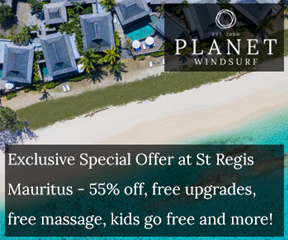 LOCAL SPOT: West Kirby, Weymouth, Vassiliki! SPONSORS: Gaastra, Mystic, Boardwise (Cannock), Dirty Dog Eyewear, Phizz, Physiofit. Motivation: When I was younger my family used to go on holidays to Ortakent in Turkey to the centre next door to Lena Erdil’s centre. When I was 13, by coincidence Lena was holding an event with Red Bull whilst I was on holiday and some of the pros came down after the Alacati PWA event. It was the first time I really found out what the PWA was and sailing with Lena and Sarah-Quita was a massive inspiration. Since then, Sarah and I stayed in touch and Sarah has really pushed to get me into slalom (and freestyle and now waves!) and persuaded me to come on tour. 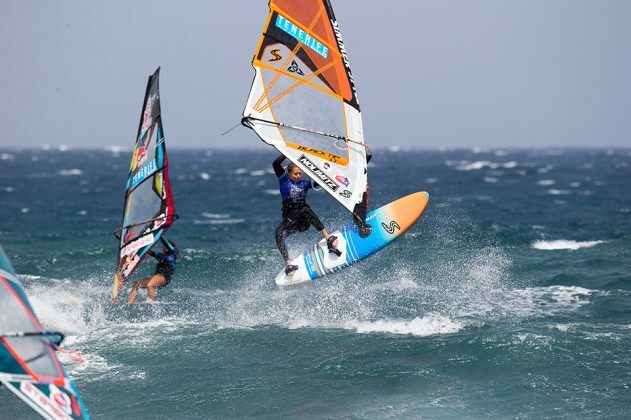 I also spent the last winter in Bonaire training with Oda Johanne, Amado Vrieswijk and Taty Frans so they were a massive inspiration for doing my first PWA event. Preparation: A bilateral tonsillectomy… this year hasn’t exactly been a clean bill of health for me and after 3 lots of tonsillitis (a severe throat infection) in the last 6 months (as well as chest infections and enough colds that I should be sponsored by Kleenex) my doctor decided I really needed to have my tonsils removed, so my event prep. consisted of two weeks of high strength painkillers and ice cream!! In the midst of being ill, I spent the 3 months prior to the operation in Vassiliki, Greece, working for Club Vass. I’ve worked there for a couple of summers now, and although we are working we get quite a lot of playtime too, so I brought my slalom gear out there and alternated between slalom and freestyle sessions. I think that keeping training varied is really important for keeping it fun, especially as there aren’t always lots of slalom sailors in Vass to train with so I’m usually training on my own. We do however have one week a year dedicated to slalom and going fast – Speed Week, which is usually headed up by Dave White, but sadly he was unable to join us this year (he’s promised he’ll be back next year!) but we still went on with the motto “do it for Whitey” and we didn’t disappoint! It was really fun to teach the guests what I’ve been learning over the last year and being on the slalom gear for 3 hours a day non-stop was really good training! The experience: I went to Denmark purely for the experience and to see what the level of the girls was like. Having watched the live stream of almost every event since I was 13 (including under the desk at school…), I thought it was going to be really intimidating meeting all the people that I’ve looked up to for so many years but it wasn’t at all. When I first arrived on the Thursday evening I saw Sarah-Quita and Oda who were both really friendly and helped me find a spot next to them in the equipment tent and told me how the week would work and then invited me out for dinner with them to get to know some of the other guys as well. They were a massive support to me throughout the week and made the whole experience much less daunting. On the whole, everyone I met during the week was really friendly but Jenna and I did find it slightly surreal being stood at a briefing next to the likes of Antoine Albeau and just walking around seeing so many of the people that we’ve idolised growing up. Lessons learned: For me the week was a massive learning curve – I only started sailing slalom less than two years ago and including Denmark the number of events I’ve done is still single figures so every event for me is still a pretty big learning curve. I’d say one of the biggest things I learned was always bring wellies to Denmark and don’t be intimidated by the people you’ve always looked up to. The event had hot tubs and saunas, I think that was my favourite part! I know that technically I still have a lot to learn and work on over the winter and then hopefully I’ll start to be able to combine all the good bits together. I found that in a lot of the races I’d do one bit really well like get a good start but then my gybing would let me down or the opposite way around where I’d have a shocking start but then sail really well and gain back 3 places. The conditions during the week threw everything at us, so it was a really good learning experience to sail in all conditions. Future plans: I started university this week, studying Sports Performance at Bath, so my future plans are currently in the hands of my tutors and whether they’ll let me take two months off over the winter to go back to Bonaire for training. I learned so much out there last year and made some big improvements and liked the vibe, so I’d really like to go back. Next season I’d like to do some more PWA events but at the minute that’s very much finance driven, so unless I can find someone to sponsor me to do the events further afield, for now I’ll be sticking to the European events.